TOKYO -- Mazda Motor Corp. has begun production of the next-generation Mazda6 mid-sized sedan in Japan, and official photos from the launch ceremony show a production version true to the sleek, sculpted lines of the Takeri concept shown at last year's Tokyo auto show. The new Mazda6 will go on sale in Europe and Japan this year and hit U.S. dealerships in early 2013. The car will debut at the Moscow auto show opening Aug. 29. 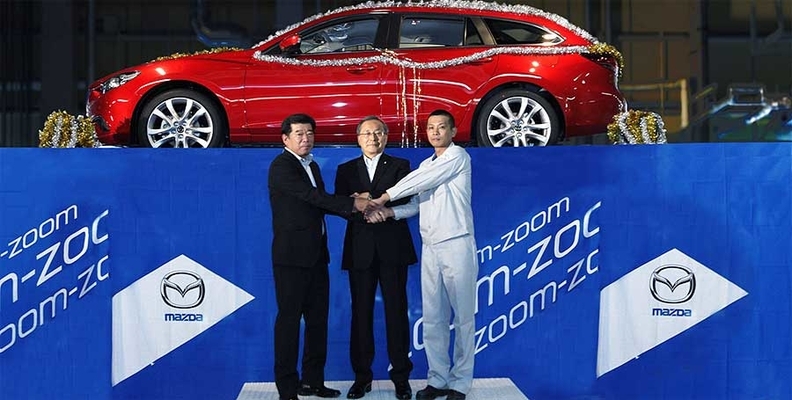 Mazda aims to make 120,000 Mazda6 units a year at its Hofu plant in southwestern Japan. Overseas production of the mid-sized sedan is being phased out at AutoAlliance International Inc., a Flat Rock, Michigan, assembly plant owned jointly with Ford since 1985. Mazda is consolidating production of its third-generation successor in Japan. The first vehicle off the Hofu line at the Aug. 2 ceremony was a red Mazda6 wagon built to European specifications and powered by Mazda's new Skyactiv 2.0-liter gasoline engine. A profile photo of the car -- draped in silver and gold garland -- shows the bulging front and rear fenders of the concept as well as the narrow greenhouse that lends a sporty look. The next-generation Mazda6 is the second vehicle to adopt the company's new design language, called kodo, Japanese for "soul of motion." Cues such as the grille, the car's cab-rearward proportions and muscular fenders debuted on the Mazda CX-5 crossover that went on sale in April.